Whether you need a new elevator, preventative maintenance or anything in between, Innovative Elevator Inc. has the solution for you. We combine new technology with decades of experience to meet your individual needs. Enhance your building's value and appearance. Raise the level of tenant satisfaction and minimize down time and call backs. 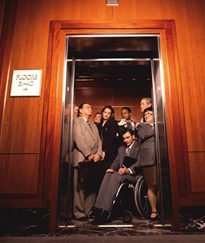 Our ADA compliant lifts provide a safe and effect way to meet all mobility needs.